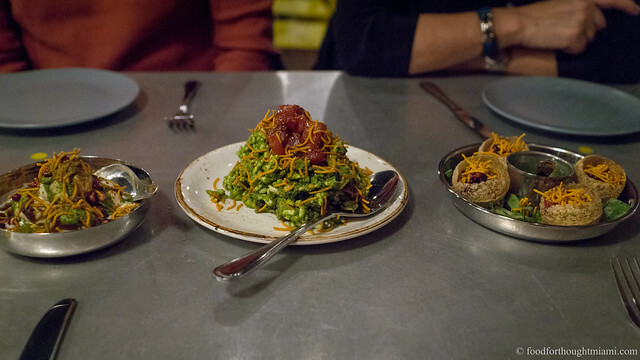 Eating House borrows equally liberally from Western cuisines as Eastern. The Catalan grilled onions known as calçots are re-envisioned here as a multi-faceted meditation on smoke: charred spring onions strewn over grilled bread that's been dolloped with a smoky eggplant "romesco," drizzled with smoked olive oil, and sprinkled with smoked salt. That sounds like a lot of smoke, and it looks like a lot of char, but it doesn't overwhelm, instead just bringing out a new level of flavor from the vegetables. Steak tartare is another Western classic that gets tweaked at Eating House, here with a subtle nod to the East. Rather than the typical fine mince, Rapicavoli's version uses larger dice of steak (which I suspect have actually been cooked sous-vide at very low temp), marinated in Worcestershire sauce and soy, which are plated in a DIY style with sesame oil infused panko bread crumbs, slivered radishes, sea beans, lots of fresh herbs and greens (parsley, carrot greens, micro onion), and a raw egg yolk. Toss together yourself; dig in and enjoy. The menu is a constant work in progress, and dishes will change, or particular items may migrate from one dish to another, from day to day. What had been coconut escargot at one point (and which a dining companion had tried and been underwhelmed by) became escargot al ajillo. Prepared in the style of the classic Spanish tapa gambas al ajillo, with lots of toasted garlic and a reduction of sherry and sherry vinegar, this was one of the standouts of an evening of eating our way through the entire menu. Another dish that was tweaked from one visit to the next is the roasted marrow bones. One day they were topped with a saucy short rib "ropa vieja" redolent with a pepper and onion sofrito, sharpened with a sprinkle of house-made lime salt. On another, the short rib "marmalade" was instead infused with black truffle. Purists will still harken for the "classic" Fergus-style marrow bones with nothing more than coarse salt and a parsley salad, but I enjoyed both iterations of this, even if the marrow can be a bit obscured by its accompaniments. Eating House's chicken and waffles are a crowd-pleaser, and I can see why: the fried chicken thighs have a textbook crunch on the outside while the flesh stays tender and juicy; the waffles are crowned with candied bacon and drizzled with house-smoked maple syrup; a swoosh of hot sauce spiked ranch dressing completes the package. It's a good version of chicken and waffles, and chicken and waffles are a good thing. What's not to like? But for me, this just wasn't as exciting as some of the other menu items. I also found myself wishing the hot sauce in the ranch dressing was turned up higher to provide some contrast to the sweetness of the maple syrup and candied bacon. Likewise, I found myself seeking more heat and spice with the grilled sweetbreads. When you read "Korean bbq sauce" and "sriracha pickles" you expect bold flavors, but this was pretty tame. The protein in more recent iterations has been chicken hearts in lieu of the sweetbreads. There are usually a few more substantial entrée-type items on the menu, which seem to be united by a couple themes: (1) they display an obsession with commercial sodas that may get Rapicavoli banished from Slow Food; and (2) for whatever reason, they're not as exciting as the small plates. Wild pacific salmon (sockeye one day, coho another), for instance, gets paired with a sweet potato purée, smoked Dr. Pepper glaze, BBQ potato chips, and hickory smoked salt. I found the dish over-sweet, and any nuance from the smoked Dr. Pepper glaze (and as sodas go, yes, I think Dr. Pepper is indeed capable of nuance) was lost. The short rib, braised for 24 hours and glazed with a kalimotxo jus (kalimotxo being an uncharacteristically low-brow Basque concoction of red wine and Coca Cola) is tender and rich with beefy flavor. Speaking of rich, Eating House's whipped potatoes one-up even the classic buttery Robuchon potato purée by adding egg yolk to the equation. A bone marrow "nugget" completes the composition. It's rich on rich on rich - which is not necessarily a bad thing, but it could maybe use some contrast, which the kalimotxo jus doesn't quite deliver. There is nothing at all wrong with these dishes, I just didn't find that they had the same multivalenced complexity as some of the smaller plates, following instead the traditional composition of protein/sauce/starch. Among the desserts, my favorite has been the strawberry "shortcake," which uses both fresh and stewed strawberries as a foil for a play on multiple textures: fluffy clouds of (microwave?) cake, crunchy bits of meringue, a quenelle of lemon ice cream, bits of lemon "icing," with the lemony citrus notes balancing the sweetness of the other components. The "brownie" is more outright indulgence: a jar of rich, thick "brownie batter mousse" (which, ultimately, I'd be hard-pressed to distinguish from a chocolate pudding), topped with brownie crumbles and chocolate chips, interlaced with drizzled salted caramel. Food lovers in "second tier" dining cities (i.e., anyplace other than New York, San Francisco and Chicago) often spend much time obsessing over whether and when their city's dining scene has "arrived." And you could spend endless hours debating the criteria for determining the moment of such "arrival." But surely one of them is the ability to recognize and sustain creative, chef-driven restaurants. There are some genuinely interesting and exciting things going on in Miami's dining scene right now, and Eating House is right at the front of them. And to me, what's just as exciting is that - on this small scale, anyway - there seems to be an audience for it. Though they only have about 30 seats to fill, Eating House has been doing a good job of filling them, even on weekdays, and in Coral Gables, no less, not exactly a hotbed of hipster dining. For all the big-name chefs and other visitors who were just in town for the South Beach Wine and Food Fest and didn't make it anywhere other than Joe's Stone Crab and spinoffs of New York restaurants: you're missing out. As much I enjoyed this, I'd love to see a little more refinement to the texture here, maybe something more of a granita instead of the clumps of varying sizes melting at different rates. And ultimately, the dish is still only as good as the tomatoes, which were much more flavorful on my first visit than the next - luck of the draw. Rapicavoli uses several different house-made salts throughout the menu, an interesting and effective method of flavor-boosting. If 2009-2010 was the era of bacon-wrapped dates in Miami, 2011-2012 may prove to be the era of chicken and waffles. I've seen versions at Sugarcane Raw Bar Grill, Sakaya Kitchen, Yardbird, and Morgan's, to name just a few. The fish, also, may be a bit overcooked, sacrificing tender flesh for crispy skin. For a particularly thoughtful discussion, I would highly recommend Misha Govshteyn's recent piece, "Houston: The Next Great American Food City?" in My Table magazine.